Director – W.D. Hogan, Screenplay – Rachelle Howie, David Ray & Robert Westcott, Producer – John Prince, Photography – Anthony Metchie, Music – Michael Neilson, Visual Effects – Race Rocks Digital Inc. (Supervisor – Scott Dewis), Special Effects Supervisor – Al Benjamin, Production Design – Renee Read. Production Company – Reel One Entertainment/Third Planet Productions/The Movie Network/Super Ecran/Syfy. FBI agent John Streich and his partner are routinely checking up on a man who has set up equipment in a field when lights appear in the sky and the man is killed by a falling object that punctures his chest and leaves a hole all the way through the Earth. The dead man is found to be missing scientist Andres Gutierrez. Chloe Edwards, an FBI science specialist, is brought in to determine what occurred. 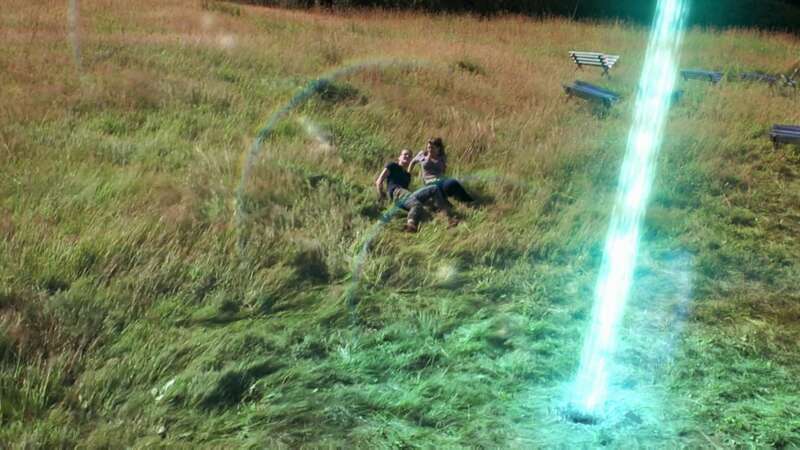 While they investigate, the hole in the ground emits a beam of energy and strange aurora play out in the sky all around the world, creating energy waves that cause devastation. Streich’s teenage son Andy hacks in to access top-level briefing documents. They discover that the Earth has been struck by a miniature white hole that has pierced all the way through to Australia and caused the Earth to stop spinning by destroying its magnetic fields. This will leave the Earth with one side facing the sun blasted by scorching heat, the other facing away and freezing in darkness with only a small habitable Green Zone in between. The only hope is scientist Kingsley Rothman who has devised the Resonator, twin satellites designed to kick-start the Earth’s magnetic fields in such an eventuality. However, Rothman has been committed to a psychiatric institution after he refused to weaponise The Resonator for the Defense Department. It is up to Streich, Chloe and Andy to spring Rothman from custody and activate the satellites before a corrupt Defense Department secretary uses them to further his own ends. Earth’s Final Hours is one of the numerous disaster and pending apocalypse films that get made for the Sci-Fi/Syfy Channel. See the other likes of The Black Hole (2006), Meltdown: Days of Destruction (2006) , NYC: Tornado Terror (2008), Lava Storm (2008), Annihilation Earth (2009), Ice Twisters (2009), Megafault (2009), Polar Storm (2009), Arctic Blast (2010), Ice Quake (2010), Meteor Storm (2010), Quantum Apocalypse (2010), Stonehenge Apocalypse (2010), Behemoth (2011), Collision Earth (2011), Mega Cyclone (2011), Metal Tornado (2011), Seeds of Destruction/The Terror Beneath (2011), Miami Magma (2011), Super Eruption (2011), Super Tanker (2011), 2012 Ice Age (2011), Seattle Super Storm (2012), 500 MPH Storm (2013), Jet Stream (2013), 100° Below 0 (2013), Stonados (2013), Asteroid vs Earth (2014), Christmas Icetastrophe (2014), Crystal Skulls (2014), Firequake (2014), LA Apocalypse (2014), San Andreas Quake (2015) and Stormageddon (2015). Earth’s Final Hours starts well. It gives the impression that the scriptwriters have done some scientific reading – not much, but a little does make a difference. The big problem is the central premise of the Earth stopping rotating – in actuality, the first immediately foreseeable thing that would happen would be exactly what would happen when an object travelling at about 1000 mph (the rough estimation of the speed of Earth’s rotation at the equator) abruptly slams on its brakes – everything not solidly nailed down would go flying off the face of the Earth. You also wonder how a micro-sized black hole, which would emit a massive gravity and radiation signature, would not be detected by astronomers before it arrived. The scriptwriters for some reason also see the Van Allen Belt as being the cause of the Earth’s rotation, when in fact it is no more than a field of charged energy particles. However, the film does create one fascinating science-fictional idea – that of the Earth caught in a perpetual non-rotating orbit with one side facing the sun being cooked with no UV protection and the other in perpetual darkness and frozen, with there only being a small habitable Green Zone around the new equator that immediately becomes sought after by all parties. The idea is scientifically nonsensical but the notion in itself is good science-fiction. Unfortunately, while the first half of Earth’s Final Hours sets up this fascinating premise, it fails to ever depict any of this – it is only ever seen in terms of a potential apocalyptic scenario that the heroes are fighting to prevent. The second half of the film descends into the far less interesting cliche stuff of pursuit by the authorities, car chases, shootouts, cover-ups, a plot to save the world with an improbable device and a crucial countdown to activate it in the crucial seconds to disaster as the world collapses around them. (The premise of having to restart the Earth’s rotation makes Earth’s Final Hours resemble the ridiculous The Core (2003), which featured a very similar plot). One of the more bizarrely amusing touches is the way the waves of energy particles have the convenient deus ex machina effect of always managing to turn up and disintegrate bad guys just when they have the heroes cornered in a shootout. Robert Knepper gets a rare role as a hero rather than a villain or tightass government agent. Cameron Bright, who had a reasonable career as a child actor in films like Birth (2004), Godsend (2004) and Ultraviolet (2006), has grown up into a teenager and plays with a likeably anti-authoritarian cockiness. Director W.D. Hogan was previously a storyboard artist on a number of other high-profile films. Hogan has also made Behemoth (2011), Independence Daysaster (2013) and Zodiac: Signs of the Apocalypse (2014) for the Syfy Channel.